Néle Azevedo’s Minimum Monument converses with the long tradition of monument: a landmark earmarked to perpetuate something in the urban space throughout History. Nevertheless, Néle Azevedo inverts the direction of the inherent exaltation of that tradition and works on the register of the precariousness and the impermanence.The path implies the acceptance that the contemporary experience is partial and ephemeral and no longer everlasting. 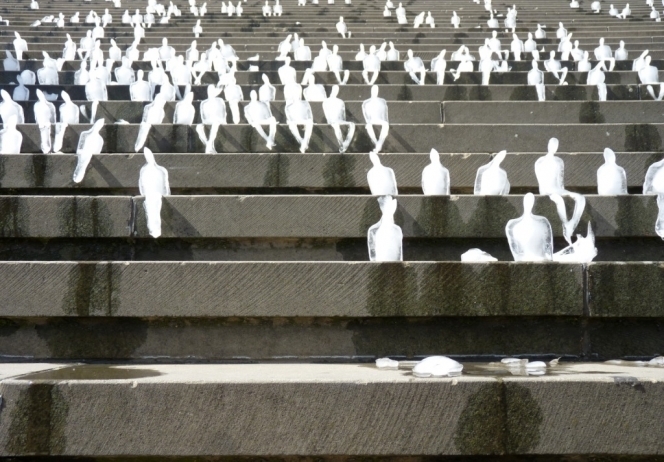 Traveling to numerous cities around the world, her minute statues of ice perform in the »exalted« urban spaces, instigating a sharp reflection about the tear and the finite that is the life time and the place of the individual within the crowd under the importance of History. Her statues seem to be entities indifferent to the daily motion of people, to the ordinary appeal of urban advertising and worldly enchantment of the landscape. Therefore, in their cold integrity on refusing the world, those statues give the amazing impression of being more real than human beings to a certain extent. On one hand, human beings are not translucent so, against light, they snuff out. On the other hand, the statues, concentrated on their crystalline interior, continuously inflate a white and blurred cloud inside their bodies of ice like a spine that rises whereas their external shape is consumed. Would there be a better visual translation for the intangible idea of soul? That is the matter beneath the artist’s work: death as a ritual and mourning as transcendence, that is the possibility of continuation of life. There is the recovery of the notion of »monument« which historic origin is connected to the sacred and funeral rituals—tombs and temples. Her monuments are minimum though. So the movement that establishes the work concerns less to the necessity of perpetuating a collective memory than of the transient individual experience due to the pure presence in a non repeated moment as a sacrificial instant.